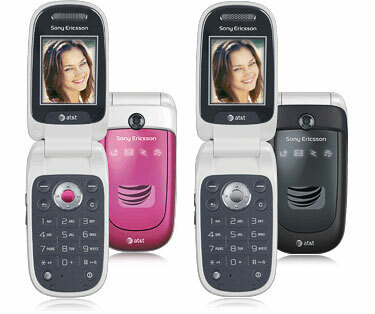 It has been a long time coming, but AT&T has finally launched the Sony Ericsson Z310a. This low-end clamshell was first announced at the end of last year and we were hoping to see it ship at the end of March or early April, but it wasn't meant to be. The Z310a may be a low-end device, but its stylish design makes up for it. Above the external display, the clamshell features several alert icons that light up during events. Other features include a 65k color STN display (128x160 pixels), a small Monochrome external display (96x64 pixels), VGA camera, IM, Polyphonic/MP3 ringtones, EDGE, Infrared and Bluetooth. AT&T is selling the Jet Black and Lush Pink versions of the Sony Ericsson Z310a for free with a 2-year contract or $179.99 without the contract. Omg i love this phone, i just got it. and its wonderful. Its smaller, and very light. This type of phone i would highly recommend to the ladies. This phone is very light weight, but easy to use and has great sound quality...I love my phone and would highly recommend this phone to anyone! I got this phone as my first phone, for graduation from 5th grade, it is amazing and was like a best friend to me, its screen colors were great quality, and the speaker was very loud and clear, the ringtones were amazing (sony ericsson was my ringtone the whole time i had the phone) and i love the music dj, and how you could record your voice, the thing i didnt really like was the quality and space of photos, i only always had 45 picture and they werent to clear, i rarely used to camera, cause i never had space ,im in 8th grade now, and my phone would start to freeze, the buttons would stop working and the black peeled off the keyboard so the keys fell out so i had to tape them back in, for a while i texted without the space key and just stuck my thumb in the hole to press it, but then when i turned it on one day the screen just went black, and never went back, so my point DO NOT KEEP IT MORE THEN 2 AND A HALF YEARS UNLESS YOU WANT IT TO STOP WORKING !